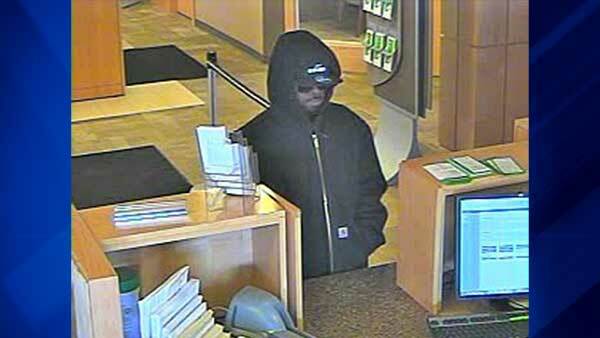 AURORA, Ill. (WLS) -- Police are searching for the man who robbed a bank in west suburban Aurora. Investigators said a man walked up to a female teller and demanded cash just before 1 p.m. at the Associated Bank in the 300-block of West Galena Boulevard. The suspect walked out of the bank with an undisclosed amount of money. Authorities said he did not use a weapon in the robbery. No injuries were reported. The suspect is described as an African American man in his 30s, about 5 ft. 10 in. tall, around 150 lbs. with a thin mustache. He was wearing dark sunglasses, a baseball cap, a black jacket, light-colored pants and tennis shoes. Anyone with information regarding the bank robbery should call the FBI at (312) 421-6700 or Aurora police at (630) 256-5500.